The project itself is almost complete. I built the power supply and interface circuitry at the weekend which has made the whole thing a lot neater and more stable. There is a minor bug where the minutes component of the time a cat has been outside rolls into the thousands after a few hours, but I expect that will be easy to fix. After that I'll need to machine the housing, flash a WRT54g to get a wireless network bridge and fit the IR beams so the system can actually detect the direction of the cat instead of simply flipping a boolean. 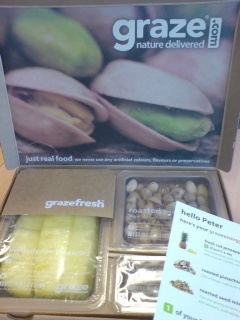 My first Graze box arrived today from Graze.com. It was very tasty. I chose the 'grazeenergy' box and got fresh pineapple, roasted pistachios and a roasted seed mix. I was particular impressed with the strange bamboo tuning fork shaped thing that can be used to eat the fruit and doubles as a scoop for the seeds. I think now I bring my own lunch to work I might treat myself to one of these a week as at £2.99 delivered it's less than I was spending per day on lunch. I've updated the project page with a new Adding an LCD section, with details of how I went about it. I've updated the project page with the general process of programming the Arduino and getting it to send the tweets. You can follow the cats over on their Twitter page, though there is just test data there at the moment.